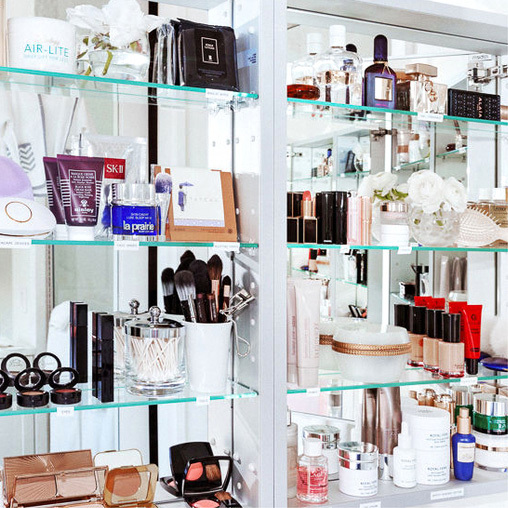 'One of my favorite things about our office is the beauty closet. It’s where we keep all of the products that come into the office for shoots or to test. We also have a bunch of old props in there… One time we were going to do a story on how to work out at your desk, so I ordered this giant exercise ball that comes on wheels—the bouncy ball version of a desk chair—but it ended up being way too low for my desk. 'Into The Closet' could be our new site name. [Laughs] Back when we didn’t have enough conference rooms, sometimes I’d take calls in the closet, which I don’t have to do anymore. I live in Brooklyn so if I go to pilates in Manhattan in the morning, I’ll get ready in there. Or if I’m going out to dinner or whatever after work, I’ll get ready in there, too. Before it was my job to think about beauty, I had a much more minimal routine and spent more energy on fashion and clothes. I got started out working at Teen Vogue in fashion writing positions—I was around people who looked amazing and had their uniforms. So I also developed a routine—I would straighten my hair every day and had a bunch of ankle boots and dresses that I’d throw on quickly in the morning, hoping to get to the office really early. That’s hard when you’re not a morning person. For a while, I was dealing with hormonal, stress-related acne. It was pretty painful, and it took a while to figure out how to get rid of it. I worked with a dermatologist at Tribeca Skin Center, Dr. Kil, throughout. 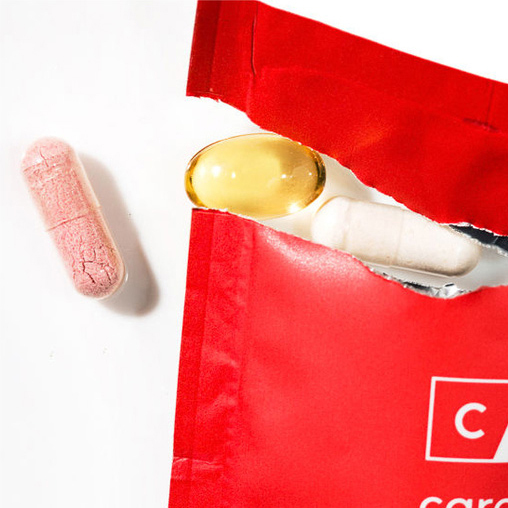 I tried Spironolactone briefly, but it didn’t help—it made me kind of shaky. I got a couple of cortisone shots... Then finally we figured out the right products for me. There’s a face wash called Sumadan that I use once a day in the shower and it knocks acne out. It has sulfur in it, and if I were comparing it to another product it would be that industrial strength hand soap that you see at construction sites sometimes…that orange, gritty hand soap. It’s not a pleasant product to use but it makes a difference in my skin. In the morning if I’m not using that, I’ll use Milky Jelly, which is the total opposite in that it smells like roses and is a complete pleasure to use. I also have some prescription benzoyl peroxide, but when I use that I really need something hydrating with it. I like Sisley’s All Day All Year—I use it all day, all year! It’s something I look forward to putting on in the morning—it smells as good as you’d want an expensive cream to smell, and it leaves your skin plumped up but primed for whatever you want to use next. My favorite sunscreen is Kiehl’s Super Fluid. At night, I like to layer serums. Recently I’ve been using Pai Copaiba & Zinc Perfect Balance Serum because my skin really likes zinc. My skin also likes Vitamin C, so I have a lot of products with that as an ingredient. When I need something heavier, I take Glossier Priming Moisturizer and mix in a couple drops of face oil. Vintner’s Daughter Active Botanical Serum is my favorite. One thing that happens when I test too many products is that my skin gets congested. The only thing that helps is extractions, so I’ll get a facial a couple times a year, usually when the seasons change. Last year, I started going to Shen Beauty in Brooklyn to see Carrie, who’s the aesthetician there. One thing that she pointed out was that I was getting milia from haphazard eye cream application. Like, I was using a couple different eye creams and wasn’t being precise—I know that you’re supposed to use those little spatula-type things to apply the cream only on certain areas, but they’ve always just been kind of frustrating to me. I actively throw them out—I politely decline that step. Carrie showed me how to apply with my hands but keep everything under control. Now I use a little bit of Chanel Le Lift Creme Yeux because it has a more gel-like consistency. And only right under my eye. I love to scrub my body. Aesop Geranium Leaf Body Scrub is nice because it’s got a texture that makes you feel like you’re doing something. But what I really like to do is dry brush. I have one in the shower, and that’s because you’re supposed to dry brush before you get in the shower, which I usually forget…so I compromise by trying to do it in the shower, which obviously is not dry brushing. But I’ll do a little bit of that and then I usually dry brush after I get out while I’m putting on all my nighttime body products. My skin stays moisturized longer when I start with a body oil—I usually use the Neutrogena Body Oil that everyone loves. So I’ll grease up, then I use body lotion. Clarins Body Lift Cellulite Control is for reducing and preventing cellulite and I believe in it. It came with a manual that explains how you can do different stretches and basically apply any body product in a way that will be better for lymphatic drainage and make your legs feel a little leaner, and this process takes at least 20 minutes. It’s not realistic to do every day. But I have done it a few times, following these exact instructions. You feel amazing afterwards. A lot of the time, I actually end up using face products on my body. There’s Kate Somerville DermalQuench Liquid Lift + Retinol, which I think makes a huge difference on my décolletage. It makes your skin look tighter and reduces discoloration. And it’s also very fun to spray because it comes out as a foam. Over the last year I’ve gotten much more comfortable with experimenting with my hair—but I think I want to be blond forever. Naturally, I’m dirty blond, but I’ve lightened my color a lot with highlights. I go to Colleen at Spoke & Weal and it’s honestly really fun to go every six weeks or so and hang out with her and work on my hair. The highlights have been great for my texture—I actually prefer to let my hair air dry now. Every night I wash it, usually with the Five Wits Rejuvenating Cleanser and Balancing Conditioner from Blackstones, and spray in some leave-in conditioner from Verb. Then I sleep on it. In the morning, nine times out of 10, I use dry shampoo to style it. My favorite is Elizabeth and James Nirvana Black, which smells so strongly that it can take the place of perfume. I put it around my part and a little throughout the length of my hair. Then I let it sit before I brush or do anything else, so it actually has a minute to add some body. Then there’s this great new product from Hairstory called Undressed, and I think the only thing to classify it as is a conditioning beach spray. It’s nice because it doesn’t dry you out, but also adds texture—if I could bottle the texture of my hair, it would end up being this product. My two main fragrances are Rose 31 from Le Labo and Balenciaga Paris Eau de Parfum L’Édition Mer. I’m not afraid of fragrance, but I also know that I’m making good choices, because whenever I get in an Uber, the Uber driver’s like, ‘You smell so good!’ I prefer woodsy scents, but they also have to feel fresh and not too heavy. Actually I was pretty obsessed with Old Spice for awhile—I always liked going to the drugstore and picking from all of the manly options…. They all smell better than women’s deodorant. But lately I am on a Mitchum kick. It’s really good. My lip balms are all with my makeup instead of my skincare because that’s usually my first step. Glossier Balm Dotcom is the most moisturizing salve, and I use it on my lips, brows and cuticles. But for lips I also like Dior Lip Glow when I want something that brings out a bit of color. I’m into lipstick too, but sometimes I don’t want to wear lipstick—I just want something that’s sheer. Lip Glow makes you look very rosy and bright, and it’s easy to apply—which is more than I can say for my eyeshadow. I’m no good at that, or eyeliner, or any eye product really. The eyeliner that’s hardest to mess up is the Tom Ford Eye Defining Pen. Sometimes I’ll just use bronzer on my lids because it takes five seconds but looks good. Benefit’s Hoola is the best because it doesn’t have any shimmer in it. Lately I’ve been finding lots of warm-toned eyeshadows that I like—the Four Couleurs Les Cendres Palette from Guerlain has this darkish, warm-but-smoky color that I use a lot. And then the Hammamet duo from Nars is a duo with peach and a bronzey copper color with shine. I like the bronze—it’s a metallic that’s toned down a bit. My lashes are pretty short so it’s tricky to find a mascara that comes attached to a brush that works for me. For a long time I used Maybelline Lash Discovery because the brush is so small—I’m really into Maybelline eye products in general. Lately I have gotten into slightly bolder lashes though, and have been loading on the Nars Audacious Mascara. I’ve also been trying to grow my lashes out. I’m using Lashfood Phyto-Medic Eyelash Enhancer—I don’t know if it’s working because I haven’t been tracking it consistently enough, but I do I feel like it’s working…maybe I’ll end up trying extensions at some point. For concealer, I use Sisley Phyto-Cernes Eclat in 2 under my eyes. It’s really nice because—do you remember those cooling rollerballs from Garnier? This one feels similar—really cooling. Then I use DiorSkin Star whenever I have acne. I mean, if I have any acne, ideally my preference is to not put any makeup on it, but if I feel like I need to, I’ll use this because I like that it has a little doe foot, and you can just kind of dab it on your spots. On the rest of my face, I start with Glossier Perfecting Skin Tint in Light—it’s the first liquid makeup I’ve ever liked using. Usually things have felt too heavy so I’d skip this step entirely and use a little pressed powder and a lot of concealer instead. The Skin Tint looks like your skin, just more even-toned. Like optimized for HD. I always add some sort of highlighter like the Nars Multiple in Copacabana. Occasionally, I like a powder—something more white and icy, like the Becca Shimmering Skin Perfector in Pearl, especially at night. The pressed Guerlain Meteorites is really good for going out, and it smells so good. Claire Knebl photographed by Tom Newton at her home in Brooklyn on January 22, 2016. Claire is wearing a Rodebjer top and Rag & Bone jeans. More Top Shelves from Team Glossier: Emily Ferber is an unapologetic disciple of the shower cap, Emily Weiss finally learns how to style her hair, and Annie Kreighbaum advises on the best photo-ready skincare.